I bought this for my Husband, after he had seen someone wearing one! He finds it must easier to use if caught in rain, than struggling to put on waterproof trousers and jacket! Quality item. Good price. Fast delivery. Good quality construction but if, like me you are over 6ft tall I think it is too short. Probably fine if you are medium height and ride a sit up style roadster, but I find the forward position adopted on my touring bike causes it to ride up on my back (its too short to sit on and pin to the saddle) and consequently leaves you exposed at the sides. Disappointing and further evidence that there is no such thing as "one size fits all"
Gore Text jackets are too short for me and I hate the clinging to legs of overtrousers. So as a commuter, this might be a bit retro looking, but it's ideal for keeping off the rain and not boiling in the bag. It's the second one I have nought after wearing out the previous one. I have a Thorn Murcury cycle with straight bars? Do you know if this cape been designed for drops or straight bar? Need to know its going to be wide enough, if you see what I mean. Also, if i was to order one and it didn't have enough volume, can I return it? Hi, it should be wide enough for straight bars. Thanks. Do the loops go around your wrists, thumbs or the handlebar grips? There is a rear strap to go around your waist, and the front straps can go around the grips or your wrists - its kind of personal choice! Does The Poncho Come With An Attached Hood? The Picture Implies So But The Detail Only Refers To A Full Zip-Up Collar. This poncho does indeed come with an attached hood. Maybe a bit daft, but how easily washable is this? Will the waterproof lining peel off in a washing machine? 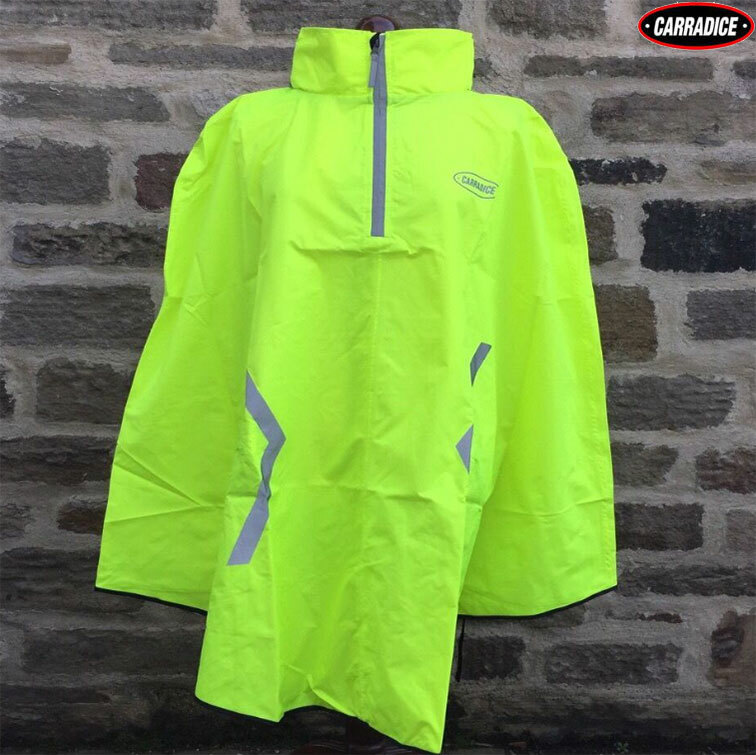 The advice direct from Carradice is that Machine washing this item, would damage the waterproof coating and possibly damage the seams. They recommend using an item like a sponge for a light clean as and when it needs it. Does It Have Wrist Straps And A Waist Strap ? How does it attach to stop it from billowing up in a gust of wind ? Yes, it has both wrist and a waist strap to keep it In place. I've checked the cape & it does not have thumb loops.